MEXICO CITY — With nothing more than his bare hands, trash collector Felipe Reyes sifts through household waste in the back of a garbage truck, including kitchen scraps and soiled toilet paper, six days a week. He searches for valuables and recyclables, such as cans and bottles, that can be resold. And he hardly ever falls ill, Reyes boasts. But he recently started wearing a mask to avoid catching swine flu, which he considers far more dangerous than anything lurking in the tons of trash his truck hauls off to an overflowing landfill run by the mafia. “We have more defences against what’s in here than the flu,” he said after removing his mask to puff on a Marlboro cigarette. Reyes is hardly the only one taking extra precautions in this city of more than 20 million inhabitants, where the flu outbreak has forced authorities to cancel classes, limit restaurants to offering just takeout service, and urge all non-essential businesses to stay closed until May 6. Authorities also called on residents to stay home and forgo decamping the city for traditional Labour Day (or May Day) weekend getaways to Acapulco. Residents have largely complied, although some in the Mexican capital have taken advantage of the tranquillity and unusually clear skies to ride bicycles, rollerblade, and jog down streets normally clogged by inattentive drivers. Many prominent institutions and organizations have also complied with orders to avoid convening large public gatherings. Some unions called off their May 1 marches, political parties suspended campaign inaugurations for the summer midterm elections, and the Archdiocese of Mexico City cancelled Sunday Mass across the region. Even cabbies in their ubiquitous Volkswagen taxis were seen wearing masks and latex gloves. The high rate of compliance with the suggestions from government officials failed to surprise pollster Dan Lund of the Mund Group in Mexico City, who studies Mexican social values. “This isn’t people obeying the government. It’s that they’re afraid, and what’s being suggested to them makes sense,” he said. Still, some signs of normalcy were visible. The subway is operating on schedule, grocery and department stores are brimming with merchandise — except for some shortages of masks and hand sanitizer — and garbage is being collected, even on Sundays. The usual stream of bad news so prevalent before the outbreak also has kept flowing. Prisoners rioted in a Mexico City holding facility, supposedly over a disputed soccer game, punks clashed with cops in the annual May 1 demonstrations, and renegade sections of the teachers’ union protested pension changes and an education reform package that would strip them of the right to sell or bequeath their jobs upon retiring. Congress also ended its regular legislative period on April 30 by convening sessions marked by lawmakers wearing masks, while voting and staging photo-ops that involved eating pork tacos to prove pork consumption was safe. “The reputation of politicians is terrible, and now with us being masked, it’s going to get even worse,” quipped lawmaker Gerardo Priego of the governing National Action Party. 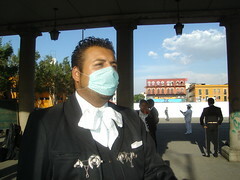 On a more serious note, the lawmaker called for authorities to use the outbreak as an opportunity to “decongest” the capital by moving parts of the federal government out of disaster-prone Mexico City, which so dominates national life, trips there are necessary to carry out routine bureaucratic procedures. 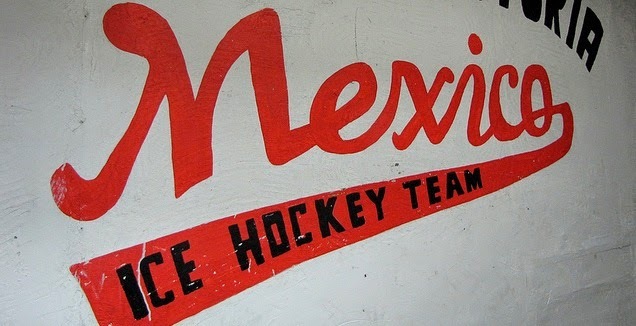 But disasters are nothing new for Mexico City, which has been flooded, hit by pandemics, and rocked by earthquakes since its founding in 1325 on a series of lakes in a high-altitude valley. And the current flu outbreak comes as the country suffers through a wave of violence that has claimed more than 10,000 lives since President Felipe Calderon declared war on narcotics-trafficking cartels in December 2006. The economy has also slumped in recent months, causing the peso to tumble and prices for staples such as food and fuel to soar. Still, many residents seemed to take the latest outbreak in stride. “We’re a society that’s used to catastrophes,” said pharmaceutical company employee America Vega, while jogging through a popular tree nursery in the Coyoacan borough. Others refused to believe the severity of the outbreak, including soft drink and cigarette vendor Maria Bautista Flores, who compared the current panic to the mythical “chupacabras” that terrorized rural Mexico in the mid-1990s through tales of an alien creature snatching goats and sheep. Cab driver Carlos Gallegos also doubted the severity of the outbreak, saying he only put on a mask to “inspire confidence” in his passengers. But in Catholic parishes of Mexico City, attendance has dropped by 60 per cent, said the local archdiocese. Church officials also asked the faithful to pray to Our Lady of Guadalupe, the country’s patroness, for intervention. Followers of the Santa Muerte, or Saint Death — a skeletal figure popular in crime-ridden barrios and among those involved in activities such as piracy and kidnapping — also pleaded for intervention and appeared to be complying with government orders to avoid large gatherings. Alberto Jimenez, who hawks Santa Muerte paraphernalia in a market famed for witchcraft and miracle herbal cures with dubious claims — a 10-herb blend for halting the flu was selling well, according to vendors — said that interest was higher than ever in the death saint, but was still failing to revive his struggling business. “People have a lot of faith, but they don’t have very much money,” he said. A lack of money, along with the forced closure of bars and halls used for weddings, has also dented the mariachi business, according to Ney Godinez, who plays a fat base guitar known as the guitarron in a seven-member band. “This is a pay day and a long weekend. We should be busy,” he said while standing idly in the Plaza Garibaldi, a hub for cantinas-goers and mariachis looking for a gig. Other destination districts normally bustling with bar and restaurant activity, such as Colonia Condesa, also fell quiet. A few businesses reported normal sales, however. Convenience-store employees reported normal customer volumes and some larger-than-normal purchases of non-perishable items and bottled water. Canadian expat entrepreneur Jody Rosen-Spearing, whose Guadalajara-area business sends Mexicans to Canada for education programs, reported having one of his busiest weeks of the year — in spite of the flu outbreak. “People seem to have confidence that this (outbreak) will end soon,” he said. Even Felipe Reyes, the trash collector, saw no real effect on his line of work, which involves selling the recyclables and valuables pulled from the garbage. “The garbage never stops coming,” he said. Are rules about flu illegitimate?